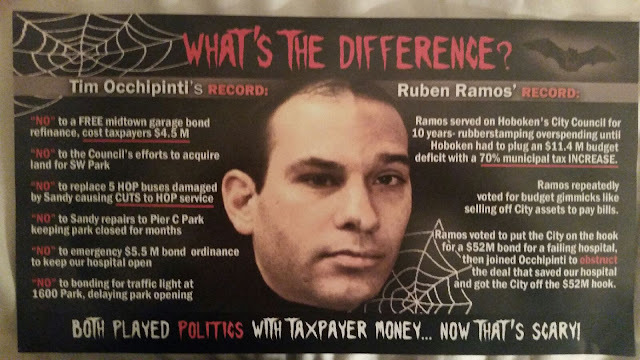 MSV: Grist for the Mill: First ward importing Russo voters from the Third? 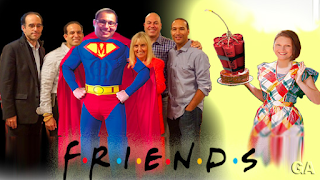 Grist for the Mill: First ward importing Russo voters from the Third? Hoboken's decisive City Council election is approaching the backstretch. The street is being engaged, money is flowing, campaigns are firing on all cylinders and candidates are jittery for what promises to be an intriguing election this Tuesday. A true three way race in the fourth ward wasn't expected by some but anticipated by others. Ruben Ramos is preparing a repeat of the 2013 GOTV effort. Mom has been knocking on doors but there's some unwelcome unannounced guests arriving on lower first street. That wasn't part of the plan. Who invited them? The second ward race is officially a three way race too. Except it ain't. Maxwell Place hosted the candidates earlier this week. Second hand accounts say Bonnie Murray fared poorly and residents were surprised at her lack of knowledge on Hoboken issues. Some reportedly shied from asking further questions to not further embarrass her. Peter Biancamano is selling himself as a budget-tax hawk of sorts. He cites his votes on the nine member board of the Board of Education as his qualified budget experience. Some BoE trustees will be alarmed to hear that news. They'll be blistering mad when they hear he's taking any credit for budget work of others. 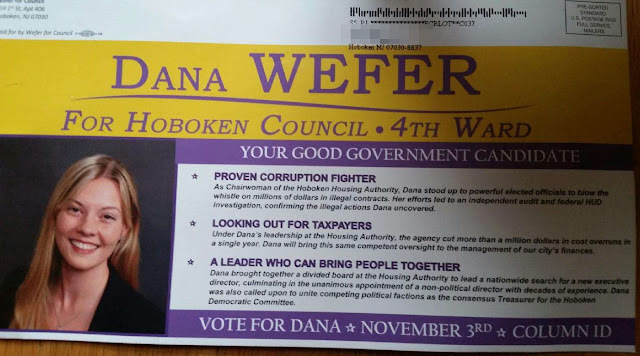 None of his eight BoE colleagues are endorsing him for council but they did hand him an ethics charge connected to campaign misinformation of his 2013 council race. Worse, a Michael Russo $2,500 loan apparently came up at Maxwell Place and a Biancamano supporter attempted to deny its existence. Audience references were made directing people to the ELEC report. The supporter got up and left in a huff, their denial and self-esteem with neighbors blown in a single Monarch Man bound. Tiffanie Fisher celebrated her birthday last night with another meet and greet. What better way to celebrate your 39th birthday again then with friends new and old? Reform activists are solidly behind her in the second ward but have they got a hang of this social media thing? Some say candidates live and die by that element of campaign strategy in 21st century elections. Michael Russo is very confident of victory in the third ward facing no ballot opposition. The spin cycle is set to launder and extra fluffy. Some say he's also keeping all those Carmelo litigation emails spit shined. Where is a scumbag Hoboken411 ghostwriter family when you need them? Operation Mayhem may revisit this election with Solomon Dwek facing off against Russo as a write-in challenger. Hey, what can we say, "Go Solomon!" The Russo Clan is rumored to be considering another form of mayhem. The latest family endeavor may port voters from the third ward to unused voting rolls in the first ward. Law enforcement is pointing a microscope at Hoboken with little election avarice operating elsewhere. The Old Guard will applaud this innovation. VBM abuse is so old hat. Radical "solutions" could be on the table with the first ward race between Councilwoman Terry Castellano and challenger Michael Defusco going down to the wire. Most observers know this will be a barn burner. People on both sides also agree Carmelo Garcia's tired act is going down the tubes in the sixth ward. Councilwoman Jen Giattino earns points and plaudits for her grace and style under fire. She never gets ruffled but you know there's a sewer in the fourth ward about to be catapulted for a long throw at the Giattino's post-Sandy repaired home. The Wire as Garcia is also known believes with the right throw, enough damage can force Giattino and her family out like a hurricane. Carmelo will proudly announce her forced departure as abandoning constituents. Wait, wasn't that yesterday? At least one campaign sign is up for Eduardo Gonzalez in the fifth ward. It's surrounded on all sides for blocks by Peter Cunningham signs. Call Perry Belfiore a brave man or call him the best home for a last stand. Time to cash out aka Carmelo Ethnic Cleansing style with a civil lawsuit against the Hoboken police and City? Let's call Beth for a lawyer and go to the videotape! Of more immediate interest, how hot and heavy is a late Vote-by-Mail effort taking shape in the fifth ward with the hope of taking Councilman Peter Cunningham out? We'll see shortly but who's watching the fox while it hunts at Fox Hills? On the BoE front, there's two "newcomers" on the Old Guard ticket led by Marine View resident John Madigan. All those who think Madigan sounds and looks a bit like Joey Pantiliano; you're right. And for those of you who don't, you don't know Joisey or Hoboken. You lay down with dogs; you get fleas. Call Monarch Man or an exterminator, take a hike to the burbs and go sell out some other town. One week out; time for cake and let's get this Election party started.